I was lucky enough to get an advance copy of this release and while I expected it to be a solid effort, I didn’t realize how much I could would to enjoy this album. Bruce is a vocalist in the style of Ace Frehley and Joe Perry — he’s not the greatest singer, but there’s a lot of charm to his voice and he makes it work. Not that he’s the lone vocalist for BK3. There are a number of lead vocal cameos: Gene Simmons and his son Nick get a song a piece, former Union band mate John Corabi sings, as does Edguy/Avantasia vocalist Tobias Sammet (who was recommended to Bruce by Eric Singer). Musically, Bruce covers a broad range of rock ‘n’ roll. There’s some modern hard rock, old school hard rock, heavy metal, rock/pop, fast, slow, etc. You’d think this would make for a patchy album, but it doesn’t. Somehow, it all flows together and it’s a bit refreshing to go from the trippy Kulick-sung “I’ll Survive” to the rock pop of “Dirty Girl” sung by The Knack’s Doug Fieger. It keeps things interesting. The album opens with “Fate”, which is a fast and fun song that throws a bunch of lyrics together that rhyme. Whether there’s a reason to any of this rhyming or not, I always enjoy songs like these. Good way to kick things off and it’s probably the must care-free song on the album. “Ain’t Gonna Die” is up next with Gene on vocals. It’s an okay song but I have to say I think Nick outdoes his dad when he sings on “Hand of the King”. That’s a great heavy modern rock song and Nick’s voice is deep and powerful, sounding a lot like Gene. Both of these songs sound like they would have fit in well with KISS’ Carnival of Souls album. “Hand of the King” is probably my favorite song on the album but “No Friend of Mine” with John Corabi on vocals gives it a run for its money — another fantastic song with a modern edge. Anytime I can hear Tobias Sammet, it’s a real treat. One of the best singers in rock today and “I’m The Animal” is a throwback sounding something like what you might hear on a late ’80s KISS album or even Revenge. Eric Singer plays drums on this one. 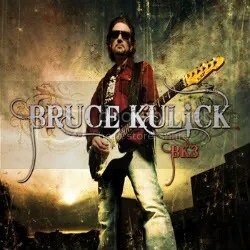 “Between The Lines” is an instrumental featuring Bruce & Steve Lukather. Very cool stuff with a Joe Satriani vibe. Overall, this is a VERY cool release that went beyond my expectations. There’s definitely a number of iPod worthy tunes here for me (Where only the elite are playlisted!) and the album as whole has received steady play since it has come into my possession awhile back. I have not heard any of Bruce’s other post-KISS works previous to BK3, but if you were a fan of his work in that group, I think you’ll like this album.